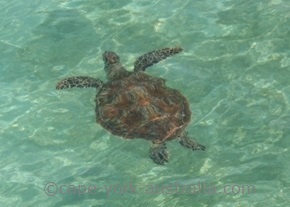 On this page you have the marine animals in the waters of Cape York. When you take your fishing boat out to the ocean or the reef, there are plenty of chances to spot whales and dolphins, dugongs, sharks, and large marine turtles. jellyfish, crayfish, giant clams, sea cucumbers, sponges, mollusks, cone shells, sea snakes, crabs (e.g. soldier crabs), fish, and all sorts of other coral reef animals. Most of Australia's dangerous animals live in the water, not on the land. 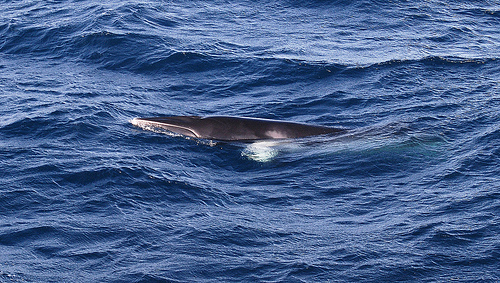 We don't have as many humpback whales as southern and central Queensland, but we have six other species of whales - Bryde's whale, dwarf minke whale, sperm whale, blue whale, short finned pilot, and orka killer whale. We also have six species of dolphins - bottlenose dolphin, common dolphin, spinner dolphin, striped dolphin, humpback dolphin and Australian snubfin dolphin. Dolphins are easier to spot and they are not seasonal. 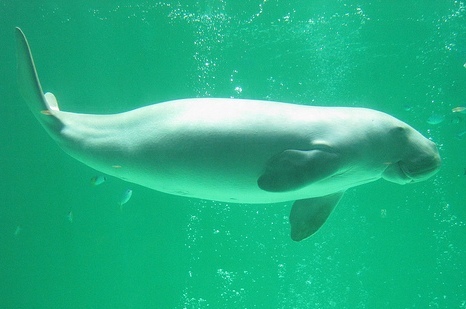 We also have dugongs - marine animals that are also called sea cows, because they eat sea grass at the bottom of the ocean. They are found in the oceans around the coasts of northern half of Australia, as well as south east Asia and parts of Africa. We have four species of freshwater turtles, and five species of large marine turtles in the waters around Cape York peninsula. Freshwater turtles are easier to spot, marine turtles are a lot larger. 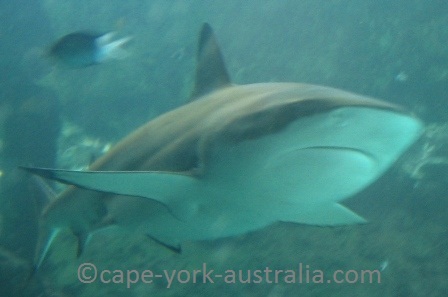 We are lucky to not to have the great white shark that is responsible for most human deaths by Australian sharks. 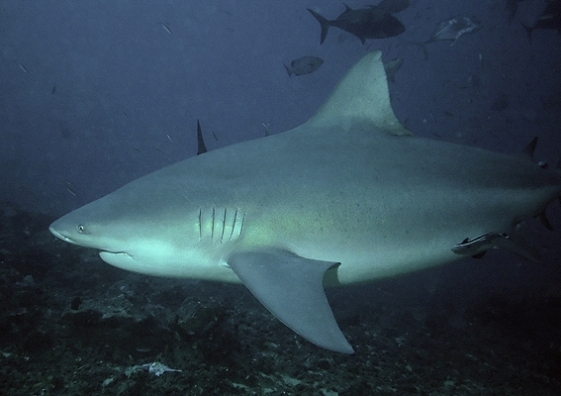 But we have bull shark and tiger shark - both killers; plus many other species of harmless reef sharks. In the tropical waters of northern Australia, we have many different species of jellyfish, most are not dangerous marine animals, but some are, and the dangerous jellyfish include irukandji, and box jellyfish - known as the most poisonous creature on the Earth. Not all Australian whales are found in Cape York. One of the most popular with whale watchers - right whales - are only found in the southern, cool waters, and equally popular - humpback whales - hardly migrate further north than Cairns and Port Douglas (most individuals not even that, so the sightings are much rarer up here, than further south along the coast of Queensland). But we have other whales amongst our marine animals. 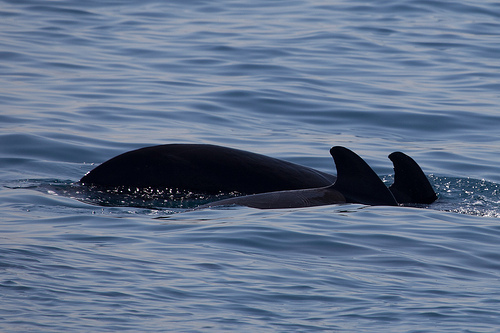 We have blue, sperm, killer and pilot whale, and our most common ones to see are brydes and minke. Brydes and dwarf minke have some similarities in the looks. 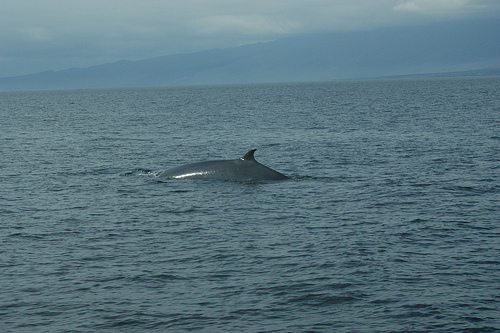 They have similarly shaped dorsal fin - a body part that is often visible. The difference is that brydes is grey while dwarf minke is black (on the upper side of the body - both have lighter coloured belly). Blue and Sperm are less common to see but easy to recognise from the typical look of the raised tail. 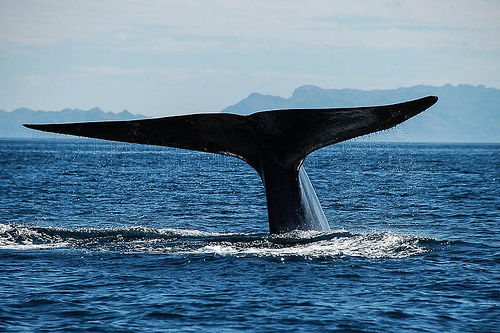 Sperm whale's can be lifted higher as it dives deeper (deepest of all Australian whales). Blue is the largest. Pilot and Orca also are less common north eastern Australian whales to see and have similar looks, mainly the similarly shaped heads and dorsal fins that are a little round (not as sharp in the tip as Minke's and Brydes'). 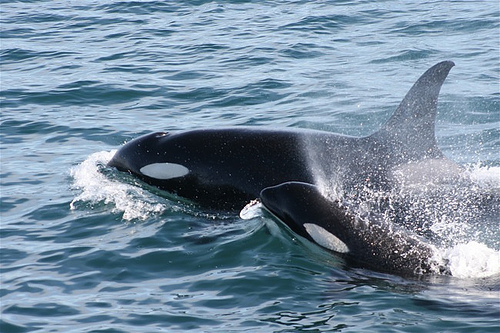 Pilot is mostly black while orca killer whale has white patches. All Australian dolphins are found in Cape York. 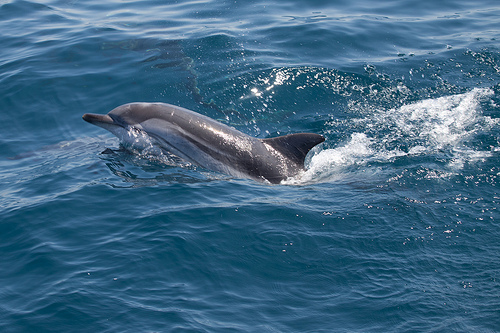 There are six species of dolphins in Australia, and in the waters around Cape York, we have them all. 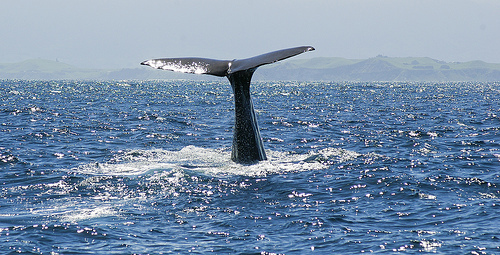 They are easier to spot than whales, they are not seasonal like whales, they come much closer to the coast than whales. 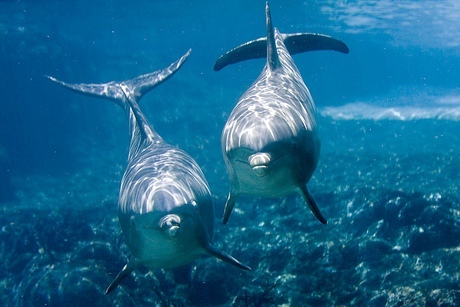 They are incredibly curious and friendly marine animals and they often come and check your boat out and even follow it. 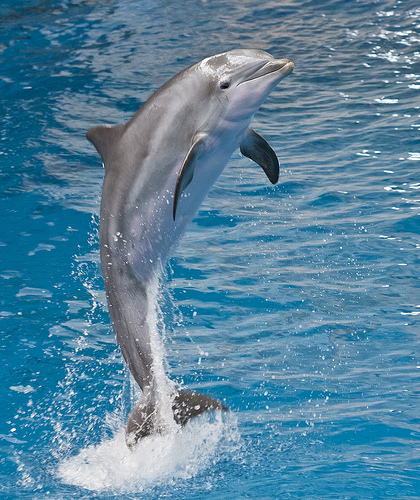 Bottlenose Dolphin is the most common of all Australian dolphins and also the best known one for that reason. It lives in all Australian waters. 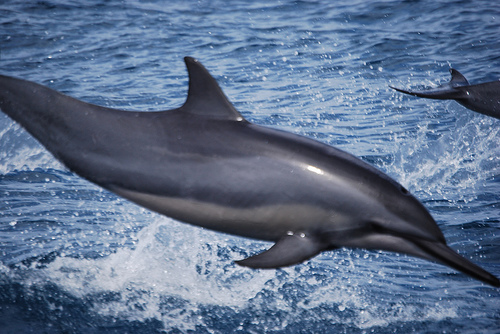 Also common is the Common Dolphin that likes to follow boats and swim right in front of the boats. It is also found in all Australian waters including Cape York. It is easy to recognise from the yellow patches on both sides of its body. Striped Dolphin has stripes on both sides of its body. 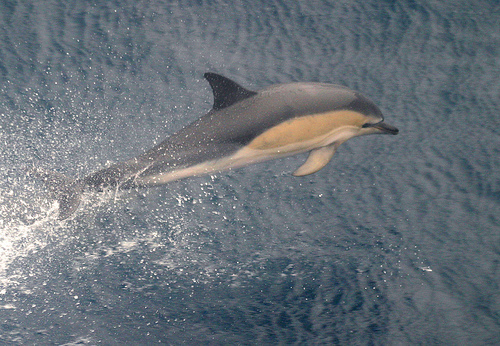 It is the third most common Australian dolphin, found along all the coasts except the waters outside Victoria, Tasmania, South Australia and south eastern Western Australia. Spinner Dolphin has a dark stripe from the end of the eye to the start of the flipper. It has a little smaller distribution along the coasts of northern Australia between about Geraldton in the west and Newcastle on the east coast of Australia. 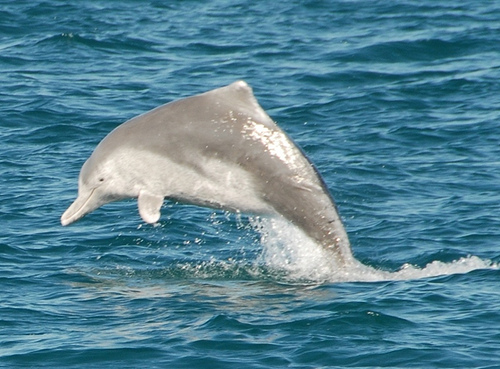 Humpback Dolphin has a low dorsal fin that looks like a hump, and its body is brownish grey. 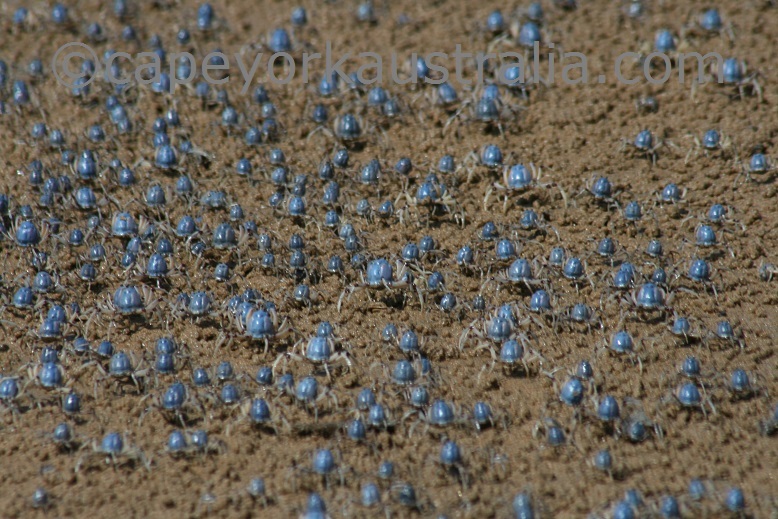 It is found all the way around the coasts of northern Australia between Sydney in the east and Shark Bay in the west. Australian Snubfin Dolphin is the only one with a round head and no beak, and it is only found in Australia. 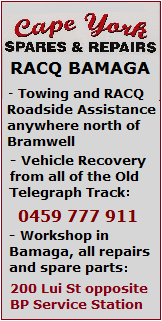 Even in Australia it has the smallest distribution - between Brisbane in the east and Broome in the west. 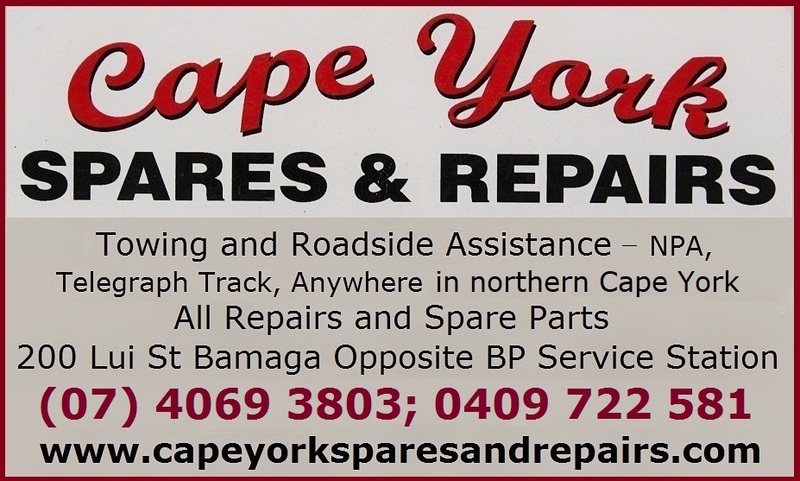 There are two dangerous Australian sharks in Cape York. You shouldn't be swimming in the ocean waters up here in the first place because of crocodiles. But yes, out of the 180-ish species of sharks found in Australian waters, two dangerous species are found in the ocean waters up here. 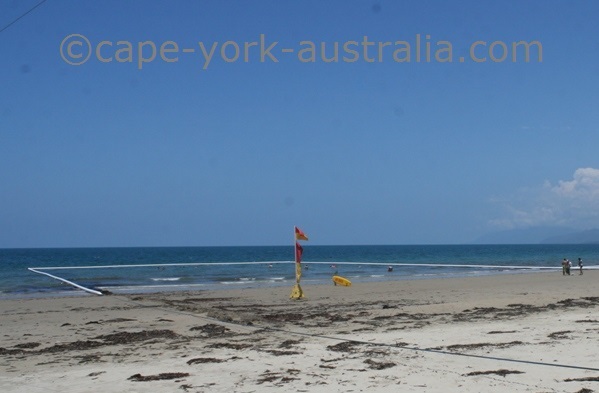 Both are found around all the coasts of Cape York, and both come close to the coasts to the shallow water. 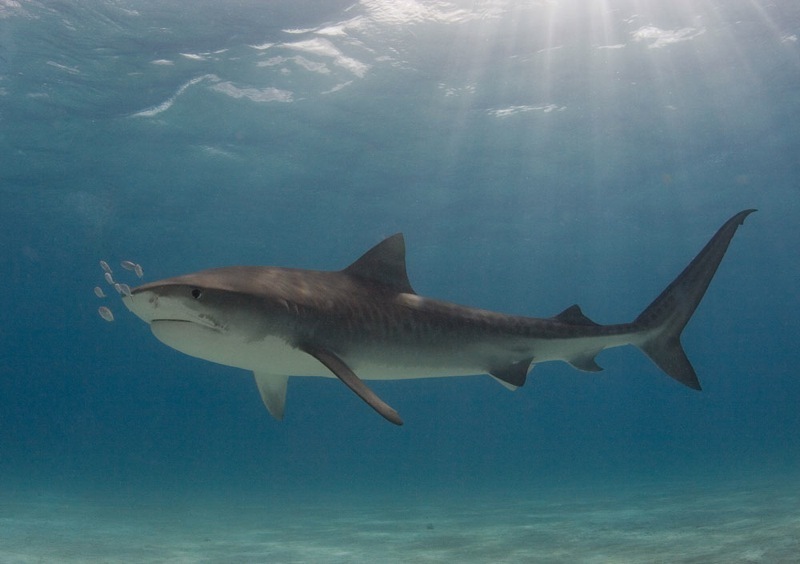 Tiger Shark is statistically responsible for more fatalities, however Bull Shark is known to be one of the most aggressive Australian sharks, and it also comes up to the coast and even into the rivers, because it can tolerate brackish and fresh water. Both are fatal marine animals. Just because we don't have the Great White shark here, does not mean you are safe from sharks in the northern waters. Add the crocs and the jellyfish to the picture, and you sure know you are best off keeping out of the ocean. Some of Australian jellyfish is very poisonous. There are many different types of jellyfish in Australia. Some are found in cold waters, others in warm waters, some are totally harmless but a few are deadly poisonous. While there are some stingy ones even in the southern waters of Australia, the most poisonous ones tend to live in the northern, warmer waters. 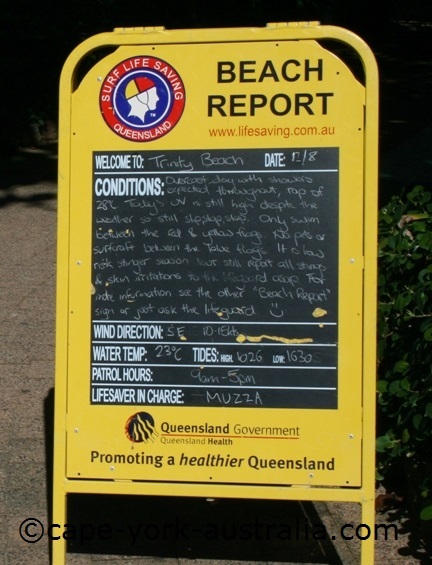 They are found along the northern, north-western and north-eastern coasts, and because Queensland is more populated than Northern Territory and Western Australia, they have made the beaches of Queensland famous for their 'uselessness'. Of course, crocs and sharks are present here too, but they are bigger anmals that you can at least see. 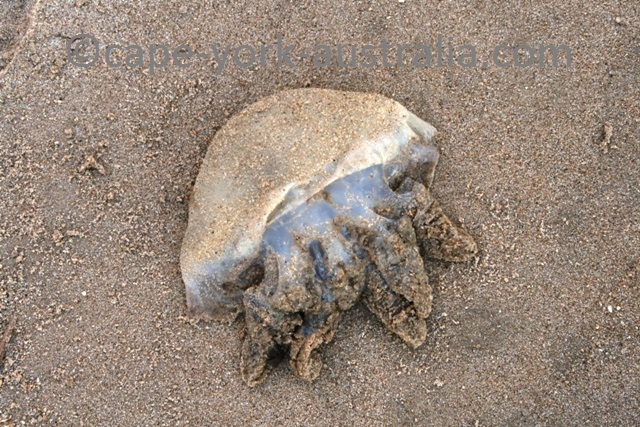 Australian jellyfish are mostly present during the Wet Season - roughly between October and May - but the further north the more frequent they are, and some have been reported any time of the year. 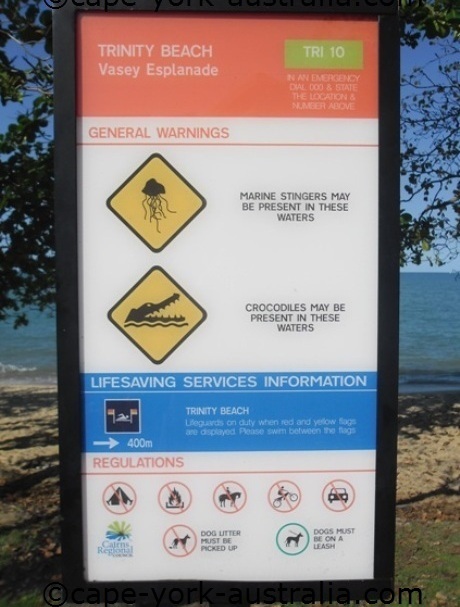 Australian jellyfish deaths are very real and definitely more frequent than spider deaths in Australia. Every few years they kill someone (often a kid), so they are seriously dangerous marine animals. 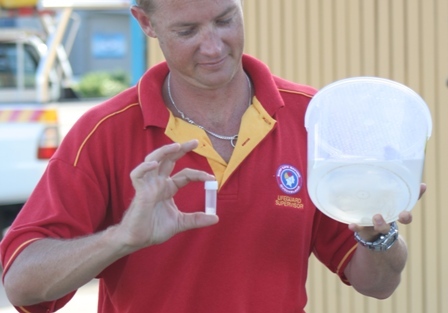 There are at least six different types of Australian jellyfish up in north Queensland. Blubber is a mushroom-shaped jellyfish with no tentacles that only causes minor irritation and is treated with cold packs. Snottie has a large bell and hairy tentacles up to almost a metre long. It usually only causes minor skin burning, but occasionally more severe. It is treated with cold packs. 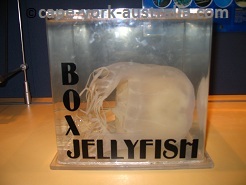 Fire Jelly, or Moreton Bay Stinger, is a large, box shaped jellyfish with four thick tentacles - one in each corner of the bell. It causes itchy, burning pain, and leaves pink or red marks on the skin. The stings are treated with vinegar and cold packs. 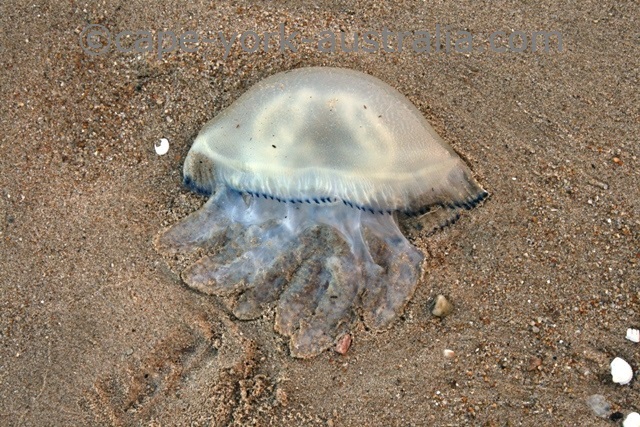 Bluebottle, aka Portuguese Man of War, has an air filled sack rather than a bell or box shaped body. Its body is blue and it has one blue tentacle, about a metre long (but can be up to 30!). Its sting causes burning pain, and sometimes breathing difficulty. It is treated with salt water, hot water and cold packs - no vinegar. 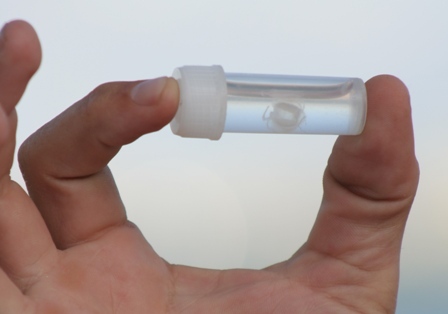 Irukandji is a very small jellyfish with a box shaped body and four, up to a metre long tentacles. It is transparent and because it is also small, it is almost impossible to see. Its sting is often initially not even noticed, but about 30min later severe sympthoms arise, such as nausea, sweating, muscle cramps, backache and anxiety. This is a serious stinger and medical aid has to be seeked immediately. Meanwhile, the sting is treated with vinegar. Box Jellyfish is famously the most poisonous creature in the world. It has a large box sized body with four tentacles, one in each corner of the bell. The tentacles can be up to three metres long. Its sting has been described as the most painful thing victims have ever experienced. The tentacles leave burning marks on the skin. The victim may stop breathing and loses conciousness. Ambulance has to be called immediately. Meanwhile, the sting is treated with vinegar. As you saw the most common jellyfish treatment is cold packs and vinegar. There are bottles of vinegar everywhere on the beaches where stingers are present. Cold packs are applied for 10 minutes at the time, but reapplied if symphtoms persist. 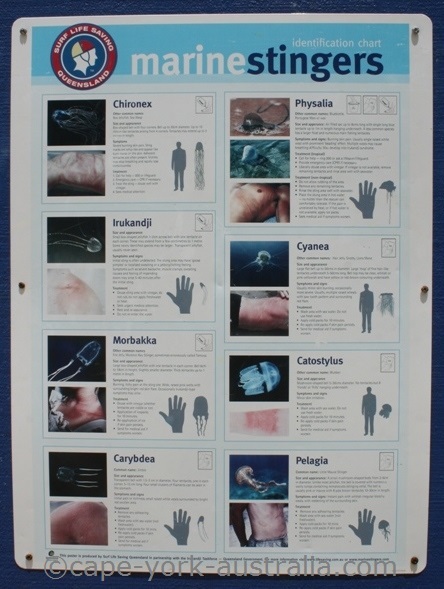 Medical aid is definitely needed with Box Jellyfish and Irukandji. With others, only if symphoms persist. 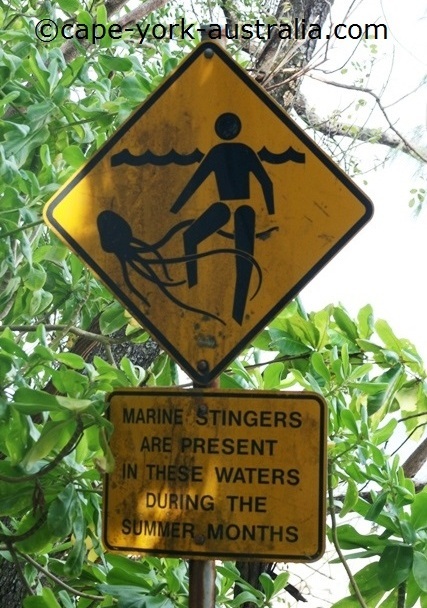 There are stinger nets during the stinger months on the more popular beaches in northern Australia. 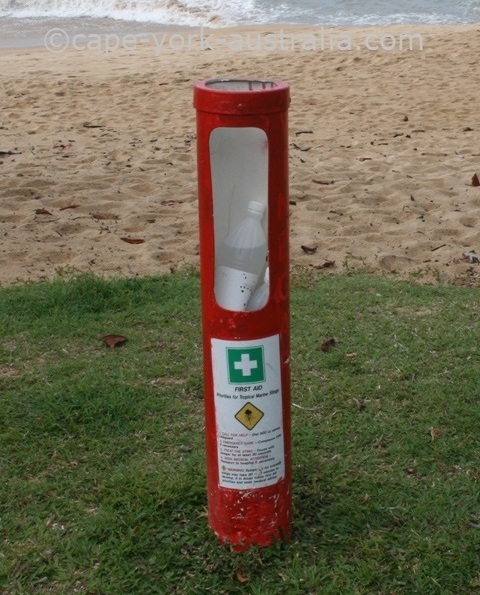 These beaches are also watched by life savers. Stinger nets decrease the risks, however they don't provide 100% protection. 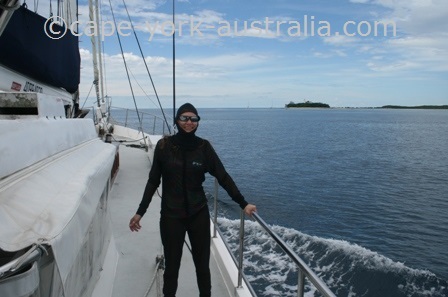 Irukandji is small enough to come through these nets. Box Jellyfish tentacles can come through them. You can wear a stinger suit which still leaves your hands and face in danger, but is definitely a pretty good protection for the rest of your body. You can wear a stinger suit, which still leaves your hands and face in danger, but is definitely a pretty good protection for the rest of your body. The best protection is not to swim in the ocean. And some less known marine animals, heard about soldier crabs? 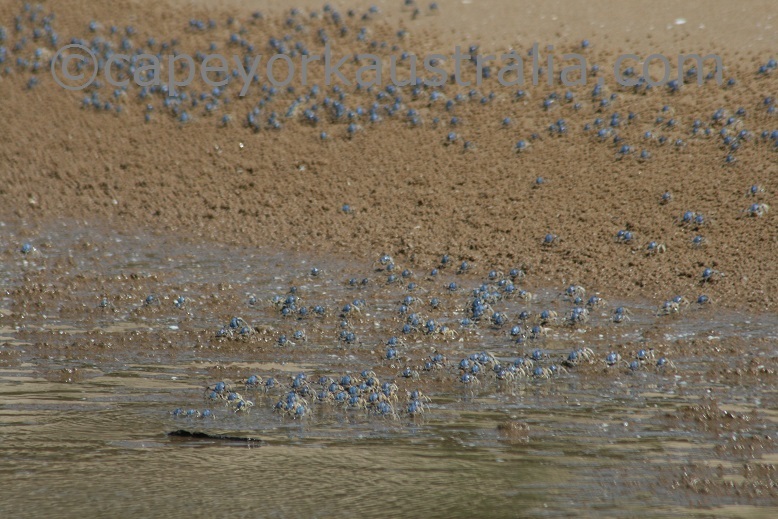 Ever walked on the beach and saw lots and lots of tiny blue crabs moving around together? I did. I usually know about things like this but it happened to me that I wondered what they were. 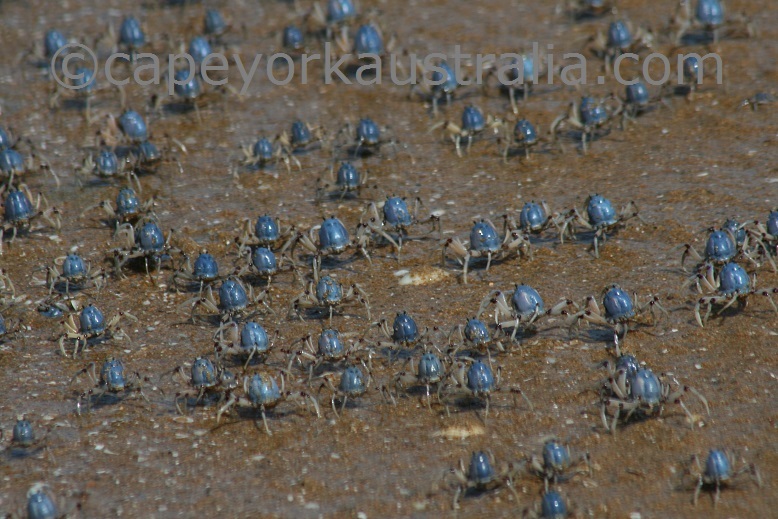 Well, they are soldier crabs moving around in an 'army'! I think they look so cool as they move around together. There are a few other things that make them different from other crabs. * They walk forwards, not sideways like most other crabs. * They have lungs (most other crabs have gills). Their tiny bodies, only 25mm in diametre, are on long jointed legs, and they they hold their claws vertically. The reason why they have the lungs is obviously that they spend a fair bit more time out of the water than the other, aquatic crabs. (mind you, they have gills too, however most of the time they use their lungs for breathing). They live on tidal beaches, often near river estuaries and mangrove habitat. At low tide, they emerge from their burrows and join to large 'armies' that can be as large as thousands of individuals. As the tide starts coming in, they start burrowing holes to spend the high tide in the burrows under the water. They also burrow themselves into the sand when threatened. When burrowing, they spiral themselves into the sand, and they carry air bubbles with them. They also leave cavities for the air to get into the hole. Their deepest burrows can be at a half a metre's depth, and they may spend some time entirely under the water (which is when they use gills). When they walk in armies, they walk to wetter sands closer to the water, to eat. They eat detritus by scooping in the sand, sucking out the organic material, and then spitting out the rest of the sand in round pellets. 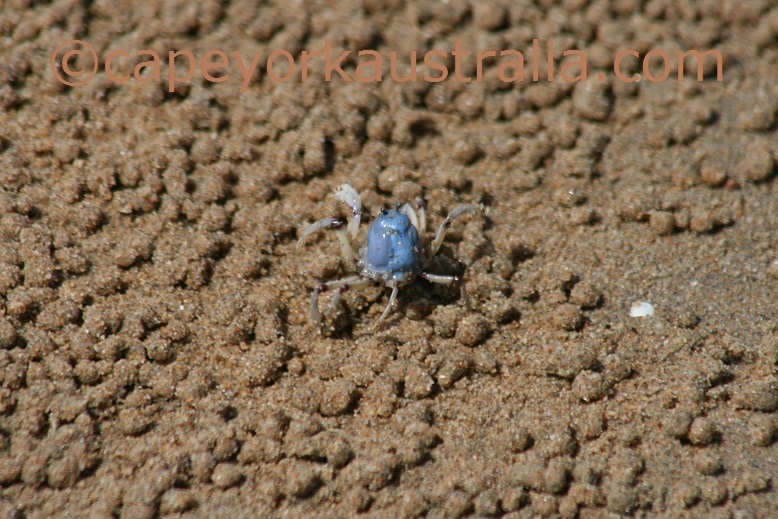 They also eat tiny microorganisms in the sand, but mostly they are scavengers so they are good in that they clean the beach up from small dead animal and plant material. The fact that they spend most of their time either in burrows or on the ground (and not in the water like aquatic crabs), saves them from most aquatic predators like fish. The main predators of soldier crabs are birds like ibis, heron, egret and some kingfishers, but also some other crabs, and fish if they do find themselves in the water. Like with other animals that flock, their grouping habit acts as protection because it makes it harder to see an individual and so confuses predators. Even if it makes the predator a little slower on catching it gives the crabs more time to burrow themselves. 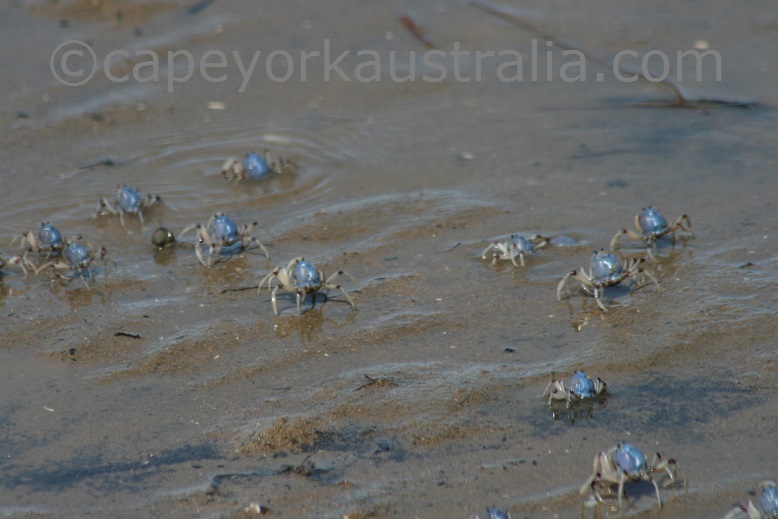 Soldier Crabs are found in eastern Indian Ocean and western Pacific, from Bay of Bengal in the north to Australia in the south. They are most common in eastern Australia and mostly north Queensland, but are found as far south and west as Perth and Tasmania.